What do you imagine when you think of “children’s church”? Most people picture a group of children being led in worship and other activities by adults. But the GMA Church of the Nazarene in Cavite, Philippines, has changed that picture. Nerry and Ivan are two of the leaders of Children’s Church at GMA. They both received their local minister’s license last year. The church board interviewed them, affirmed their call to preach, and presented them to the congregation. 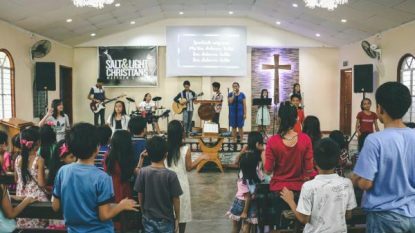 They help to oversee an exciting Children’s church at GMA with lively worship, biblical preaching from God’s word, and lots of discipleship and outreach activities. At the GMA church, there are another 15 teen leaders who guide and disciple the children. The children’s pastor, Mark John, who helps to oversee the entire ministry, is 23 years old. He is currently studying theology at a nearby institute. Yes, “children’s church” has a very different meaning at the GMA Church of the Nazarene. They believe that children are not the church of tomorrow. They are the church of today. The pastor of the GMA Church is Stephen Gualberto. Stephen was one of the children from the Philippines who, many years ago, was sponsored by Nazarene Compassionate Ministries. 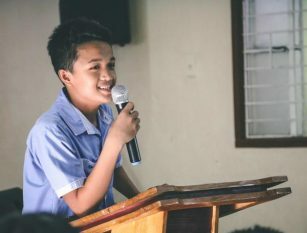 Prior to this, his parents were living in a very poor “squatter” area of Manila, but were forced to move when the area was closed down by authorities. He and his family literally lived on the streets for several days, before being offered food and water and a place to stay by a pastor of the local Church of the Nazarene. Stephen & Theresa Gualberto with children, Dash and Orvi. Stephen and his family are products of the outreach efforts of the Church of the Nazarene. And he is impacting others for Christ. 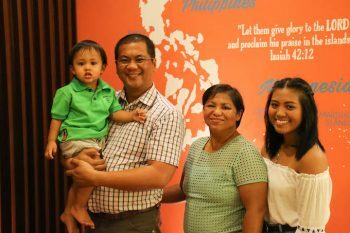 Not only is Stephen the pastor of the GMA Church, he is also the field strategy coordinator for all of the Philippines and Micronesia field. Your giving to the World Evangelism Fund and Nazarene Compassionate Ministry impacts the lives of people like Stephen, who then impact the lives of hundreds of others! Like the teenage preachers and church planters, Nerry, Ivan and Paul John!